On what was a great day of racing, Silvano stamped his mark on Greyville’s July meeting by siring the first two home in the prestigious Gr.1 Vodacom Durban July. Top honours went to the 2016 runner-up, Marinaresco, who turned on the turbo up the straight, adding the country’s premier race to his already impressive resumé, under Bernard Fayd’Herbe. 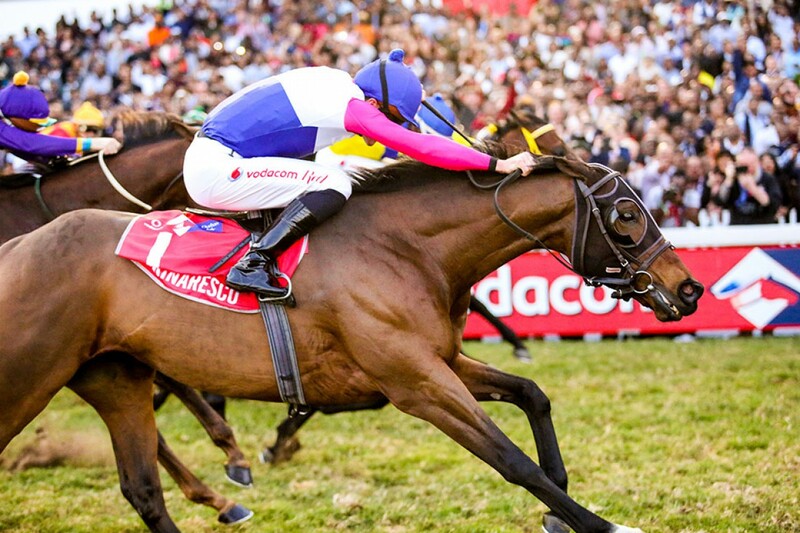 The champion gelding scythed his way through the field to emerge victorious, finishing a head in front of Silvano’s SA Derby winner and favourite, Al Sahem. In a blanket finish, only third-placed Edict Of Nantes snatched away another Silvano trifecta and a possible Maine Chance-sired quartet, as Silvano’s daughter Nightingale shared fourth with Krambambuli. The latter, a confirmed stayer by Black Minnaloushe, was the surprise package in the race and at one stage looked set to cause a major upset. Silvano is certainly making the July his own, his progeny having dominated two of the past three renewals. In 2015, he made history when siring a Maine Chance-bred trifecta, with his sons Power King, Punta Arenas and Tellina filling the first three places. In 2016, Marinaresco came charging from the rear to fail by a diminishing neck, but twelve months later, he laid that ghost to rest. Silvano’s achievements did not end there. Maine Chance-owned Bella Sonata came with a flourish to run third in the Gr.1 Garden Province Stakes. Earlier, Silver Class had started her sire’s big day on a high note when landing the Greyville opener, while at Turffontein, Artemisia claimed the final race to take her winning tally to four. Silvano’s barn mates, Querari and Black Minnaloushe, likewise added to a memorable weekend, the former siring a double victory for Sabine Plattner on July Day. Speedball La Favourari looks destined for the top after scoring his fourth win on the bounce up the Kenilworth straight, and just over an hour later, Head Honcho came with a perfectly-timed run to carry the Plattner silks to victory in the second race at Greyville. Black Minnaloushe also weighed in with a winner at Turffontein when his Maine Chance-bred son West Coast Warrior justified favouritism in the penultimate race of the day.